Q: How did you first get involved with EUROCLIO? In 1991, I received an invitation from the Council of Europe to attend a conference on history education in Bruges, Belgium. At that time, I was employed as an Adviser for History at the National Curriculum Council in England and I was a member of the Historical Association. Maitland Stobart, from the Council of Europe, had initiated the conference just after the collapse of the Iron Curtain so that history educators from the east and west of Europe could meet. During the meeting, Maitland Stobart suggested that, starting a European non-governmental organisation of history educators, could contribute to developing peace, stability and mutual understanding in Europe. 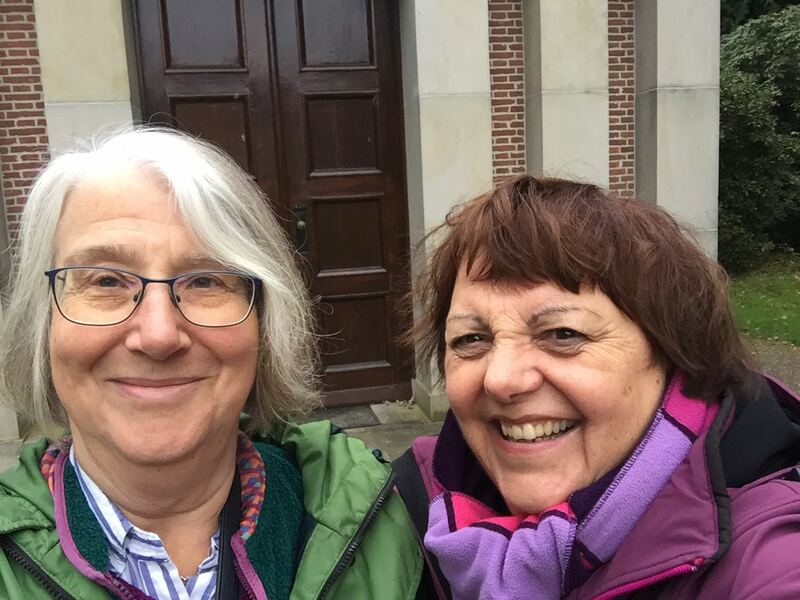 After the meeting, Joke and Hélène from the Dutch History Teachers Association decided to accept Maitland’s challenge and with a group of people from different countries started EUROCLIO. Later, Joke came to talk to me in London about history education. But it was not until 1996, when I had changed my job, that I became more directly involved: an involvement which lasted while I remained directly connected with history education in the United Kingdom. And even now, I still have friendships with several people from Europe who I met during EUROCLIO activities. Q: For several years you were heavily involved in EUROCLIO, as editor of the Bulletin, board member and later president, and working on several projects, right? By chance, during the Annual Conference of 1997 in Budapest several of the EUROCLIO Board members resigned, including the then editor of the Bulletin, Martin Roberts. As the Board needed a native English speaker to edit the Bulletin, I was invited to stand for the Board. I was happy to be elected because my job had changed and it was easier for me to be more directly involved. Then a few years later, the other members of the first EUROCLIO Board had to resign as their statutory terms had finished. This included Joke van der Leeuw, who was one of the founding members and the first President of EUROCLIO. As I was the most experienced Board member, I was asked to stand for president and was subsequently elected during the 1999 Annual Conference in Edinburgh. Q: I remember your presidency was not the easiest period for EUROCLIO? Being a president is never easy as there are always complicated matters to deal with. But in this period, we had to deal with two important and sensitive issues: the relationship between the EUROCLIO Secretariat and the Board, and the bi-lingual character of the organisation. EUROCLIO started as an organisation of peers: history educators coming together to discuss their profession and trying to improve their skills and develop history teaching. But soon the organisation managed to gain considerable funding and was granted some big projects from the European Union. To deliver these projects, permanent staff needed to be employed and a professional financial administration became vitally necessary. In order to run the organisation, greater knowledge of law and accountancy became important. The Board members, who were only doing the work on a voluntary basis as well as their jobs as history educators in their own countries, were unable to take on this level of responsibility. The decision was made to split EUROCLIO in two closely interconnected organisations: the European Association of History Educators, which already existed and a Foundation and Secretariat, which was set up to execute big and complex projects, raise funding and cope with finances, employment, tax regulations, etc. Now this sounds easier than it was. During the process, there was some confusion about who was responsible for the funds from projects and who was responsible for funds from the subscriptions from member organisations and this led to a lack of trust. It took several years of lots of talking to ensure that the financial transparency was obvious to all and to rebuild trust within EUROCLIO. Q: And what was the second complicated issue? Well, EUROCLIO has always had a strong connection with the Council of Europe and because of this it started as a bilingual organisation with English and French as its two languages. This meant the Bulletin was issued in two languages and there was simultaneous interpretation at the conferences. After a few years, this became an issue in the organisation. The costs of translation and interpretation were very high and only a small group of people made use of the translation. However, it was also important to recognise that French was an official Council of Europe language. But as the organisation grew, more history teacher organisations from Central and Eastern Europe joined EUROCLIO and there were proportionally more people who used English as their international language. Member organisations then asked whether it was necessary to spend a lot of money on translation. It is not an under-statement to say that EUROCLIO was never very rich and that simultaneous translation during the Annual Conferences cost a fortune. Q: How was it solved? Time and building trust were important factors. Discussions on the language issue lasted for several years with people exchanging views and arguments. In the end, it was boiled down to considering what the organisation wanted to spend its very limited resources on. After a few years, the French speaking community within EUROCLIO began to accept that spending so much money on translation and interpretation was perhaps not the most important priority. So, during the General Assembly in Tallinn in 2001 it was decided by democratic vote that the Bulletin would only published in English and that simultaneous translation during the Annual Conferences would only be provided if external funding was available. Q: What was your role as the President of EUROCLIO in these issues? I always saw my role as a facilitator trying to solve sensitive issues through debate and discussion. Working with people from different countries was both interesting and challenging. People bring their own assumptions to meetings about how they might best be organised and run. During my time, it was possible to identify different approaches within EUROCLIO. Some countries had a culture where people were very pragmatic in their approach to meetings and others were more formal. For example, some people like minutes of meetings to be exact reports of what people say and others just want action points. Some people want formal votes and others are happy to look for general agreements: some people focus on outcomes and some on procedures. These are not straightforward issues and during my time as President I learnt that it is important to talk about how meetings are organised. There are different ways of working democratically but if people are not clear about what is happening, confusion and misconceptions can happen. Q: In 2002 your term as president ended. But it was not the end of your involvement in EUROCLIO? No, not all. I was involved in several EUROCLIO projects on history education, for example a project in Estonia and Latvia and a project in Bulgaria. In both projects we were assisting local history educators in developing innovative teaching materials and then in using these materials to train local teachers. These were lovely and very inspiring projects. One of the most interesting aspects of them was that you were committed to a group of history educators in another country for several years, making personal friendships, but also really getting acquainted with the culture, habits and educational practice in other European countries. As well as my involvement in EUROCLIO, I was also working as an adviser for the Council of Europe to help develop history education. However, when I ceased to be actively involved in history teaching in the UK, I felt that it was time to stop being directly involved in EUROCLIO. Q: EUROCLIO over the years benefitted from British methods of history teaching and many British history educators disseminated their knowledge and experience in Europe via EUROCLIO. But what did you gain from your meetings with history educators from other countries? Well, I met lots of kind and interesting people, several of whom remained friends. Moreover, it was interesting to meet people and learn about their personal experiences, especially because many people had grown up under Soviet rule and their lives had shaped by those experiences. Professionally, it was a privilege to introduce people to methods of history teaching used in the United Kingdom. Designed to encourage pupils to think critically about the past, these methods involved using sources and encouraging pupils to debate different interpretations of history. But this was not a one-way exchange and I learnt from others. I was also very impressed with the professionalism of teachers in the countries I visited. In discussions, it became clear to me that all history teachers struggle with similar issues, for example: how to design an interesting history curriculum when there is so much history that could be taught and which is also very significant. Is it best to go for breadth or depth? Should one cover the whole span of history or just more recent history? How does one balance the need to develop critical thinking with the need to develop a breadth of understanding? These are questions that history educators return to again and again and perhaps they will never be totally resolved. Q: How do you look back on your involvement in EUROCLIO? Being a member of the Board, especially being the President was a very interesting period in my life. Sometimes it was stressful, but it was also stimulating. I was happy to help ensure the continuation of EUROCLIO and to support the Secretariat in The Hague, with Joke van der Leeuw at its head. Now EUROCLIO has grown and developed but it is good to see that, even in a much-changed international environment, the organisation is still alive and active. April 15, 2019 What do teachers have to say on debating controversial subjects in the classroom?